The apartment is in the residence "LE VIEUX MOULIN". Small residence of 12 dwellings, in a calm and residential quarter. 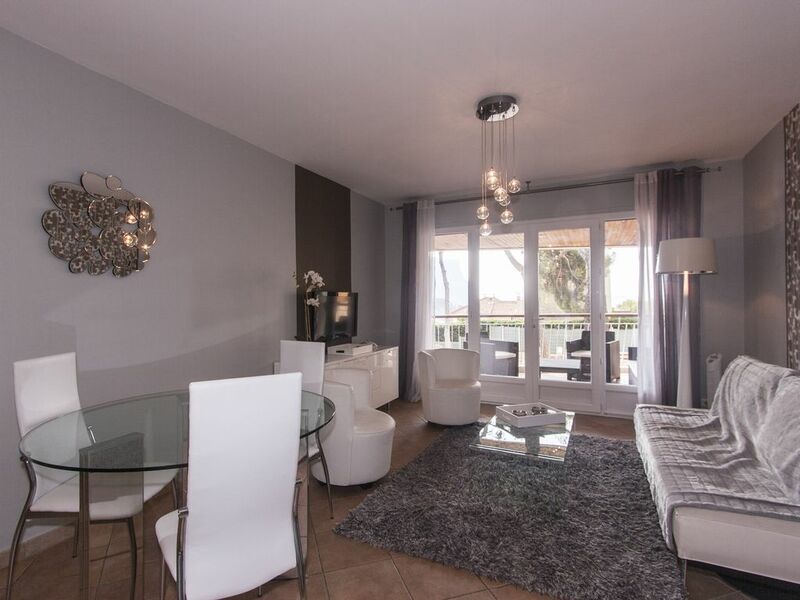 A 5 minute walk from the port and the beach, the apartment is a contemporary T4 with 70 m2 terrace. Completely renovated and very well equipped, sea view, Cap Canaille, castle of Cassis and crown of Charlemagne. Large Private Parking (Box) closed in the residence. The view of the Château de Cassis by night is exceptional. Comfort: flat screen TV, DVD player, WIFI, washing machine, dishwasher, oven, microwave, nespresso ... Sleeping 5 Adults- 1 Child. A motorcycle and lockable bicycle room is at your disposal in the residence. Between sea and vineyards, between cliffs and creeks, Cassis is a very pretty village, animated and endearing. Make your market on the port; enjoy in one of the many restaurants, Provencal culinary specialties (La Bouillabaisse, fish soup, Aioli ...) accompanied by one of the good wines of Cassis. But Cassis is especially well known for its Calanques, among the most beautiful in the world. Fantastic location, beautiful apartment has all amenities, not perfect for kids. We stayed in the apartment as a family of 5, 2 adults and 3 young children 7, 7 & 11. The apartment is situated in the perfect location to enjoy both beaches by foot as well as the village and includes parking if you need parking. The apartment also includes a huge terrace for outdoor dining, all the pots and pans you need to cook as well as tv and internet. As foreigners traveling the biggest problem with the apartment was that everything is in white, the furniture, cabinets etc. and the woman that introduced the apartment (who was sweet and lovely) warned us that we had to be extremely careful and that the apartment had to remain perfect when we left. She advised us not to put our toothbrushes on the sink for fear that they might make a mark. We went around the house and she showed us a few marks but said we would have to pay if there was any additional "wear n tear" scratches or if the door stops weren't blocking the doors, the doors would then make a mark if the wind came up and shut the doors quickly. We are also vacation owners so I am well aware of wear n tear but this seemed excessive. So, as a mom I was constantly telling my kids to go outside and not even sit on the furniture because they had dirty bodies from playing outside all day. And, getting a deposit check for 1400 Euros (for 10 days) was a bit hard but French friends gave us a check to use. At the end of the stay we paid the 50 Euro cleaning fee, I scrubbed the outdoor white furniture, and they were very generous to waive the 20 Euro per sheet fee because I didn't realize they were rentals and not included. So, I would highly recommend this apartment for 2-3 adult couples but not for children. idéalement situé, près du port et de la plage du Bestouan. très propre et très fonctionnel. terrasse merveilleuse avec possibilité de changer d'orientation en function du vent. Un superbe appartement, très bien équipé, proche du centre ville avec une belle vue sur la mer, garage appréciable, très grande terrasse utilisable du matin au soir, nous avons été ravis de cette location. Magnifique appartement avec situation idéale au calme et à 5 mn du centre. La terrasse est sans aucun doute le point fort sans oublier la qualité des prestations. Les photos sont tout à fait conformes à la réalité. Accueil sympa et chaleureux d'Edwige. Propreté impeccable ! Un bonheur ! À noter également la qualité de la literie. Oui, c'est un peu en hauteur comme la plupart des habitations de Cassis mais la montée se fait sans problème avec bonne conscience ;) avec une vue magnifique en récompense. Merci pour les promesses tenues. Superbe appartement contemporain très bien équipé avec une vue splendide ! 2 semaines en couple avec 3 ados dans cette location très propre et de bon standing avec une très grande terrasse et la vue sur la mer et le Cap Canaille aux couleurs changeantes suivant l'heure : magique ! Un grand merci à Edwige qui s'est proposée de faire notre lessive en attendant le remplacement du lave-linge défectueux et qui est d'une grande disponibilité et gentillesse. Seul bémol (mais auquel on ne peut rien changer) : les milliers de cigales qui nichent dans les pins tout proches ainsi que carillon de l'église qui sonne toute la nuit les heures et demi-heures et qui nous ont empêché de dormir avec les portes-fenêtres ouvertes ! Il faut également avoir une bonne condition physique pour remonter du centre ville... Le garage fermé en sous-sol est très appréciable pour garder la voiture fraîche, surtout qu'il est impossible de stationner dans Cassis. En tout cas, le site et les prestations en valent la chandelle ! A 5 minute walk from the harbor, shops and beaches. Excellent location.